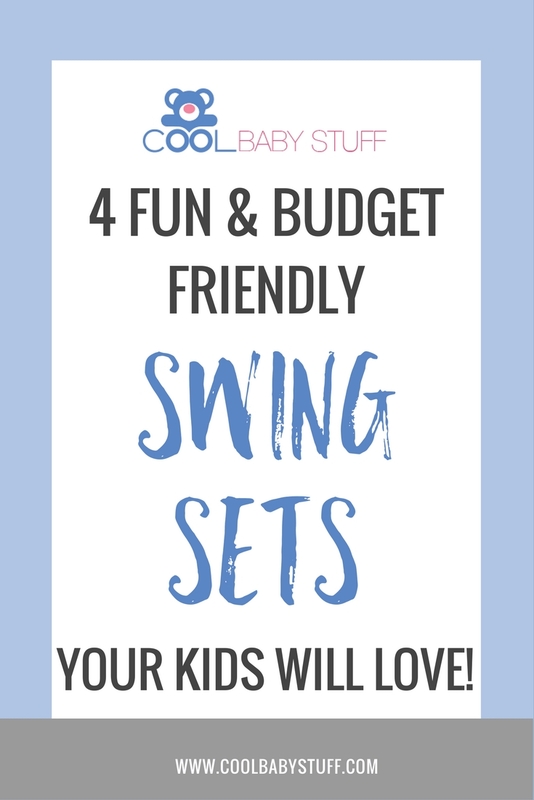 I’m so excited to talk about the best swing sets for kids! We have a good size backyard and I’m always thinking about ways to make better use of it for both entertaining guests and my children. Recently a good friend passed down a small playscape that was handed down to her several years ago. My children have loved it, but I know that my three year old would love to have a swing and a few other gadgets — who can blame her?! While I have seen a few swing sets that need a few repairs on my neighborhood sale pages, I have my hopes set on a new set that we can hold onto and enjoy for a while. Also, neither my husband nor I are very handy. So there’s that! Here are a few of the best swing sets for kids that I am going to consider and the best part? Each one less than $200, so they won’t break the bank! If you prefer to stay indoors, here are 10 fall books for kids. The Flexible Flyer Play Park Swingset is first on my list because, in my opinion, you get the most bang for your buck.This set includes two sling swings (that are much easier for preschoolers to get up into than hard seated swings), a glider to swing with friends, a wavy slide and a four person lawn swing. With all these ways to play this set is perfect for your kiddos and their friends to play with for hours. While you do have to assemble this swing set on your own, it only takes 2-3 hours to do which is nothing compared to other similar sets. The weight limit for each swing is 81 pounds so be sure to consider how many years you want your kids to be able to enjoy this set before you buy. This Almansor swingset is a great option if you’re looking for something a little non-traditional. This set includes a small trampoline that kids of all ages will love! It also includes two swings that can be adjusted to four different positions, a glider, and a slide. Each seat on this swing can accommodate up to 100lbs and Almansor includes the option for a toddler swing making it ideal for families with toddlers and school aged children. This swingset is my top choice if you’re a do-it-yourself sort of parent. When you purchase this set, your buying all of the hardware, attachments and plans for the swingset. You have to purchase the wood separately. While this may begin to sound pricey, this set gives you the choice of adding on to your swingset as you can afford it and as your children grow. The set includes all the plans to build a custom set, a discovery mountain, steering wheel, climbing rocks, periscope, “mega-rider” and the option to separately purchase a slide. Because you’re building the set piece by piece, just as you like it, the estimated time to assemble the entire kit is 5-9 hours. Don’t let this timestamp frighten you though, the Swing and Slide gives you the flexibility to attach it to a current deck, assemble piece by piece and select a size that is perfect for your space and your family. Natus Inc thought of it all when they put together this swing set option. The ‘Super First Swing Set’ will have your kids, “active for hours with endless fun”. Not only that but the set can accommodate up to six children for play making it perfect for family gatherings and playdates with friends. 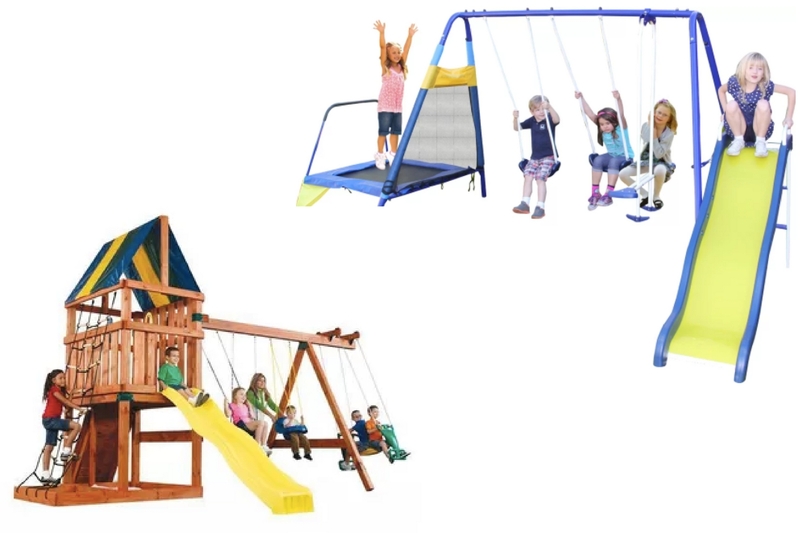 This set includes two hard-seated swings, a trapeze for your future acrobat, a slide, and a unique addition of a see-saw. Natus also padded the legs of the set for the safety of your children- a feature that I wish more sets included! The set is compatible with a toddler swing and each swing station can hold a maximum of 100 lbs making it another set that will last your family several years! I still remember getting our first swing set when I was little. It was a metal set similar to most of these and it was such an exciting addition to our backyard space. We played outside for hours at a time with neighborhood friends until we were called in for dinner. I hope to give my children a similar memory of mom and dad setting up a swing set for them to enjoy. Maybe with these affordable picks, that day will be sooner than later? !